As expected, there was a decent amount of Transformers news at San Diego Comic-Con 2011. TFW2005 was there to cover it all. From Dark of the Moon to Transformers Prime and more. SDCC 2011 – The Making of Transformers Prime Panel Live! 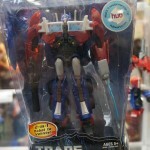 SDCC 2011 – Hasbro Trasformers Panel Live! SDCC 2011 – IDW Transformers Hasbro Panel Live! 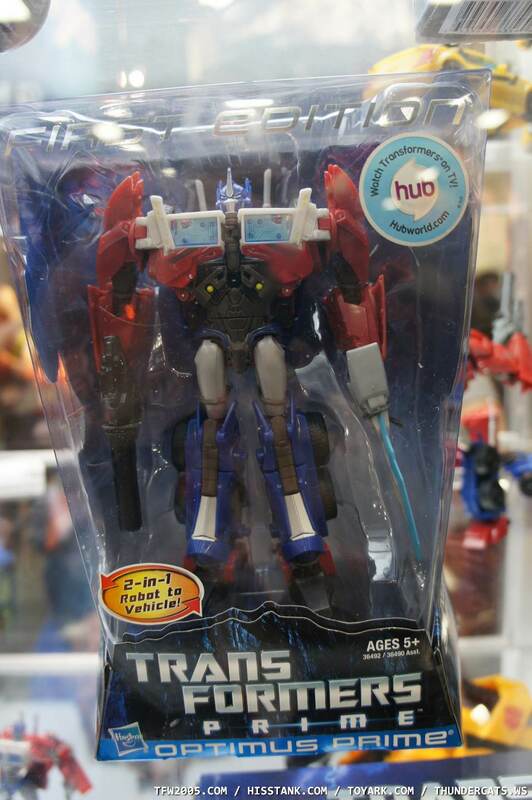 The Transformers Prime Optimus voyager looks BEAUTIFUL. I knew these would be cool but not THAAAAT cool! Very impressed by that one. Going to look at Bulkhead more once I can actually get onto 2005. Why does the Ultimate Optimus Prime have to be so expensive? Damn. Are the lines getting combined? I believe that we may see what is left in the case from SDCC but it may fall under the new movie line. So we have 30th anniversary coming up. Renegades and the remaining PoC stuff are what we have seen, and it looks like that will all be on 30th anniversary cards and packaging. Anything not released there I would expect to see shuffled into the movie line somehow (maybe even post movie). It looks like 30th Anniversary wont be the same as 25th anniversary, so I don't think we will see a crap ton of classic stuff coming out, because the 30th anniversary will be taking place the same year as movie 2, and Hasbro generally likes to focus on their movie product during that time. Yup, movie II is the primary focus of next year. I forsee a lot of the initially planned 30th stuff...like vehicles, as retailer exclusives next year. I see "traditional" versions as retailer exclusives with futuristic retools(like the POC Ghost HAWK), as movie II offscreen vehicles. That way Hasbro makes their money back on the new tooling in the same year. Are there others? Sure. However, those were the ones I noticed that were clamored for the most. After putting together 2 of the new Sky Strikers, I am VERY VERY impressed by the quality and how much better it is built compared to the original. If we were to get a new Tomahawk made like the new Sky Striker we would be in for one hell of a treat. Absolutely want a Night Raven and WHALE. Hell my wishlist would go on for days. But one that they should do, is a damn Night Boomer. Night Boomer or GTFO. Yeah HELL YES! Night Boomer is a must. They gave that damn hint at JoeCon too..vintage Night Boomer box in that display case...hell quite a few of the vintage toys shown in that display case have modern incarnations in the current lines. Add into the fact that the Night Boomer was hard as hell to buy when it was released, and that it's a repaint of the new Sky Striker that fans DO WANT...and bam, that's reason enough to buy one. Wonder how they would do the stickers though, wasn't a fan of the original paper stickers...maybe glow in the dark text this time instead of background? I'd even settle for plain white. In any case I would buy at least 2 and open both. I may have also figured out a way to separate the wings from landing gear AND keep them functional. I'm not seeing any robot heroes under the robot heroes link, I though all the "Heroes" line were dead. Did they mean to put Rescue Bots? Very dissapointed after reading the title. A lot of the transformers stuff on display is underwhelming. Air Raid looks like crap sadly.